Guest blogger Katie Cunningham is an Assistant Professor at Manhattanville College. Her teaching and scholarship centers around children’s literature, critical literacy, and supporting teachers to make their classrooms joyful and purposeful. Katie has presented at numerous national conferences and is the editor of The Language and Literacy Spectrum, New York Reading Association’s literacy journal. “Guess What?. . . I Can Read This Book All By Myself!” These are exciting words for any teacher or parent to hear. When we hear them we know the child in front of us sees himself or herself as a reader, often for the first time. Right now, teachers across the country are wrapping up their first round of reading assessments, using the information to make choices about small instructional groups, and determining teaching points to support all of their students as growing readers. But what assessment measures do we have that gather information on who sees themselves as readers? Are we listening closely enough for those words? When we hear them what do we do? More importantly, when we don’t hear them, what can we do? As pressure mounts for teachers who are now more-than-ever evaluated on student performance, the temptation can be to turn reading instruction into the mastery of a set of discrete skills. While foundational skills are essential, they are not sufficient. The Common Core State Standards remind of us this by separating the Reading Literature and Reading Informational Text Standards from the Foundational Standards. In this way, reading is seen as a set of integrated skills that are the hallmarks of core learners. Core learners as defined by the standards demonstrate independence; build strong content knowledge; respond to varying demands of audience, task, purpose, and discipline; comprehend as well as critique; value evidence; use technology and digital media strategically and capably; and come to understand others’ perspectives and cultures. When we hear, “Guess what, look what I can do”… “I’m a reader!” we hear independence and know that the path towards deeper learning is right around the corner. But when we don’t hear those words, learning is in danger. So, how can we as teachers and parents support our young students to see themselves as readers and core learners? That is, how can we scaffold their learning of sound-symbol understanding while emphasizing that reading is about participation, joy, and a sense of belonging? More children will read books by themselves when they have a reason to read them. With a set of core-aligned resources fully developed, the Bebop collection offers teachers opportunities to support early emergent, emergent, early fluent, and fluent readers with powerful, leveled texts that support not only growing readers but also developing core learners. Will this child build independence? In what ways? What are the interests of this child? Will this child see himself or herself in this book? Will this child come to understand others’ perspectives and cultures? Are there opportunities in this text to build strong content knowledge? Around what areas? Will this child have the opportunity to comprehend as well as critique? What evidence-based learning can I look for? In what ways do technology and digital media connect to this reading or create opportunities to respond to the reading? For my nearly 5-year-old, What Do You See at the Pond? and Can I Have a Pet? have been breakthrough books this fall sparking him to carry them wherever he goes. When he reads them to his brother he says, “Look here, this is a funny part coming up because the boy sees himself.” He has found a reason to read, to reread, to pass on a love of reading. We need to take advantage of this collection across our classrooms this school year. 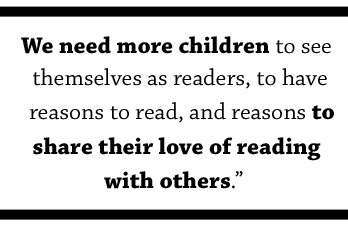 We need more children to see themselves as readers, to have reasons to read, and reasons to share their love of reading with others. Previous PostRemembering Illustrator Sonia Lynn SadlerNext PostTrick or Treat: Diverse Books for Halloween! Nothing beats a “joy of reading” when it comes to increasing a child’s reading achievement. I was thrilled to see my book “Can I Have a Pet?” used as an example. There is a joy unmatched by anything else when a child realized he or she can read. A mom sent me a video of her little girl reading “Can I Have a Pet?”. She was so excited as she turned the pages and recognized the words. That’s why I love writing for kids.